Grass fed and pasture raised- the fat facts | how do you like them green apples? You are what you eat- a cliché never more true than when discussing the fats in our diet. You’ll have heard a lot about essential fatty acids- specifically omega 6 and 3. These fats are “essential” because they are building blocks that we need to obtain from the diet- our body can not manufacture them. Getting the right kinds of fats and in the right ratios determines much about our health- from skin to cardiovascular, from hormones to chronic inflammatory diseases. You are either feeding inflammation with the types and ratios of fats you are eating, or you are promoting anti-inflammation pathways in your body. The ideal ratio of omega 6 to omega 3 fats we are after for good health is 2:1. While this may have been the way our body’s evolved, in the last 140 years (or so) there has been a dramatic increase in the consumption of omega 6s (which are pro-inflammatory) and a dramatic reduction in omega 3s (which are neutral/anti-inflammatory). Some figures say that a modern diet filled with polyunsaturated seed oils and processed fats can be in ratios up to 25:1!!! This is a serious health concern. The facts are simple. A diet high in omega 6 will be high in inflammatory mediators contributing to heart disease, diabetes, cancer and other inflammation driven diseases- while a diet high in omega 3 fatty acids will be protective, by driving anti-inflammation pathways in the body. Now supplementation is one way to increase your omega 3s. Common sources are fish, krill, flax, chia seed and hemp seed oils. Also, we can increase the intake of these fats from foods, as well as decreasing the amount of omega 6s from the diet (vegetable oils, seed oils/margarine, soy oil- any oils used in processed foods and frying). But there is another way we can tip the scales in favour of good health, and this is where the importance of grass fed /pasture raised beef comes in. Lately there has been a move towards grass fed animal products- with brands available in most chain supermarkets now. But what exactly is the benefit of eating grass fed? I used to wonder, how people got enough omega 3s before capsulated fish oils and adding flax seeds to everything. The truth is, animal fat used to be a major source of omega 3 fatty acids! The natural diet of ruminant animals is grass. In Australia most cattle are raised in pasture and feed on grass, but about 35% of cows are “finished” on feedlots where they spend 6-8 weeks eating grain to increase weight. In grass fed animals the fat content is similar in ratio to the ideal for human health- 2:1. In animals who have fed on grain the ratios can vary from 5:1 to 13:1. Photo courtesy of my clever chook raising friends, at Autumn Farm in Bega NSW. 3- High in a fatty acid CLA (conjugated linoleic acid) which is a potent ally in preventing cancer, high cholesterol, high blood pressure, osteoporosis, insulin resistance, immune dysfunctions/allergies and inflammation. It also influences body composition/fat distribution. 4- Reduced exposure to GMOs- Corn and soy fed to grain fed animals comes can often be contaminated with genetically modified products. The impacts of GMO’s on human health are not understood and their safety is controversial- they are best avoided. 5- Better animal health and welfare- Pasture raised animals are living on their ideal diet in their ideal environment, free to roam and have significantly less health issues than animals who are fed on GMO grain living their last months in feed lots. And for those who want an ethically raised, sustainable product- it’s grass fed all the way. 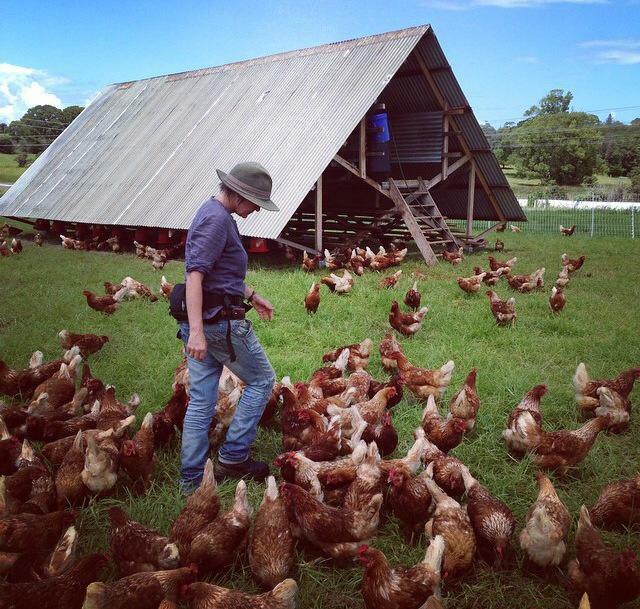 My gorgeous farming friend, Linda working with the pasture raised hens. One of the things I love the most about living where I do, is access to local farm raised produce. I have the luxury of buying much of my animal products from farmers markets- where I can speak directly to the farmer about their production methods and welfare of the animals they raise. If you’re in the city, it can get be a bit trickier to access producers of ethical and pasture raised animal foods. Luckily these changes are catching on- and more and more networks, small goods shops, cafes and health food stores are labeling their products so that you have more of an idea of how and where your food was raised. So, if you’re eating animal foods- do your best to chose pasture raised, small scale and as local as possible. It’s better for your health, for their health, the environment and the local economy. So much you can feel good about. Most of the beautiful pictures in this post are found on my friend Linda’s Instagram page “GROWFARMFORAGE”- she’s nothing short of an inspiration and her pictures are divine.